We’d love your help. Let us know what’s wrong with this preview of Treasure in Paradise by Kathi Daley. To ask other readers questions about Treasure in Paradise, please sign up. 3.5 stars rounded up. In this seventh outing with TJ Jensen and clan, TJ agrees to assist with resort renovations at Gull Lake, for a friend of her father. He has recently had a stroke and needs someone there to watch over the renovations, make decisions about what has to be done, and keep a developer at bay. Having grown up in a resort setting, she is the perfect person for this task. Even better, she brings along family, friends and pets for this extended stay. Rounding out the group, is a par 3.5 stars rounded up. In this seventh outing with TJ Jensen and clan, TJ agrees to assist with resort renovations at Gull Lake, for a friend of her father. He has recently had a stroke and needs someone there to watch over the renovations, make decisions about what has to be done, and keep a developer at bay. Having grown up in a resort setting, she is the perfect person for this task. Even better, she brings along family, friends and pets for this extended stay. Rounding out the group, is a parrot named Blackbeard. He belongs to the owner and he is one smart and chatty bird. Throw in a purported pirate treasure and some treasure hunters and this could be a great adventure. What they did not expect was to find a dead body in the attic the day they arrive. She knows the man was killed, but when the case is deemed accidental, she is wondering what the deputy is hiding. TJ sets to investigating what happened as well as trying to find information on the land developer who is trying to force a sale of the resort. Ushering in spring with a beachy feel is the latest T.J. Jensen Mystery by Kathi Daley. Follow and ponder the trail of clues that shower the pages as the mystery begins without delay and you're captivated chapter by chapter. This story starts with a family excursion across the country to Turtle Cove Resort to help an ailing friend renovate his oceanside property. The Jensen's menagerie of cute and lovable pets are joined by Blackbeard, a parrot who's an eyewitness to a murderer, if he can get the Ushering in spring with a beachy feel is the latest T.J. Jensen Mystery by Kathi Daley. Follow and ponder the trail of clues that shower the pages as the mystery begins without delay and you're captivated chapter by chapter. This story starts with a family excursion across the country to Turtle Cove Resort to help an ailing friend renovate his oceanside property. The Jensen's menagerie of cute and lovable pets are joined by Blackbeard, a parrot who's an eyewitness to a murderer, if he can get the message across to T.J. with his limited vocabulary! The awesome sea turtles that innocently nest annually on the beach are highlighted and part of some of the dastardly plans afoot. The plot moves like a breeze, with fun and excitement alongside a touch of sweet romance, the warmth of good friends and family, and the unexpected twists and turns that abound throughout the pages. I always look forward to a new story in this enjoyable series! I voluntarily read an Advance Readers Copy from NetGalley and Henery Press. This is a fun series by Kathi Daley. Tj is a fun character and I enjoyed her adventure on Gull Island. When she stumbles across a dead body, Tj can't help but investigate. A parrot named Blackbeard, treasure maps and pirate stories will keep you guessing until the end. This is my favorite series by this author. I voluntarily read an ARC of this book provided by the publisher and NetGalley. This time TJ agrees to watch over resort renovations for a friend of her father. Having grown up in a resort setting, she is the perfect person for this task. Even better, she brings along family, friends and pets for this extended stay. Also, we meet a most remarkable parrot nam It is difficult to name a favorite series by Kathi Daley but TJ Jensen and friends is always at the very top of the list for me. I love the interaction between the characters. It is a wholesome, multigenerational series. I accepted a copy of this book from Netgalley and voluntarily read and reviewed. 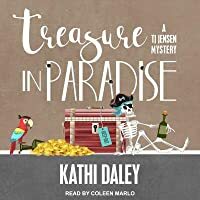 Treasure in Paradise is the 7th book in the Tj Jensen Paradise Lake Mystery series by Kathi Daley. Tj Jensen has agreed to oversee the renovations of Turtle Cove Resort on Gull Island for Garrett Hanford, a friend of her Father, and provide a summer getaway for her half-sisters, Ashley and Gracie, her friend Kyle Donovan, her Grandfather, Ben, and family friend Stan Griffin plus their three dogs, and four cats. 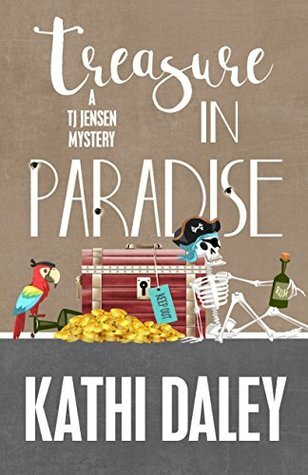 Gull Island is a great place for a relaxing vacation, until a dead body enters the pi Treasure in Paradise is the 7th book in the Tj Jensen Paradise Lake Mystery series by Kathi Daley. Tj Jensen has agreed to oversee the renovations of Turtle Cove Resort on Gull Island for Garrett Hanford, a friend of her Father, and provide a summer getaway for her half-sisters, Ashley and Gracie, her friend Kyle Donovan, her Grandfather, Ben, and family friend Stan Griffin plus their three dogs, and four cats. Gull Island is a great place for a relaxing vacation, until a dead body enters the picture. It doesn’t take long for Tj and company to realize not everything is as peaceful as one would expect. Add in preservation of land with nesting turtles, a history of pirates hiding treasure, treasure hunters, and corporate land developers to the mix and mysteries abound. Somehow working through the battles and sorting out truth from fiction feel less overwhelming with family and friends to see you through. Tj and friends find the courage to keep moving forward. Together they can create magical miracles and these battles will be won. Treasure in Paradise is a superbly written addition to Ms. Daley’s Tj Jensen mystery series. The characters are well-developed, the plot is tightly woven with lots of twists and turns, all the elements of a classic cozy mystery including a touch of romance are perfectly integrated. Given the cliffhanger at the end of the story, can’t wait for the next book in the series! This is the perfect book to read on a beautiful Spring day, relaxing by the pool or on the beach, or possibly while on a cruise to the Caribbean Islands where pirate lore abounds! I won a copy of this book and voluntarily reviewed it. I have purchased the previous books in this series and a Kindle copy of this book. This is such a great series and I was excited to read this book! In this installment of the series, TJ Jensen has traveled to Turtle Cove Resort on Gull Island to help her father's friend Garrett renovate his resort. The entourage includes TJ, her half-sisters Ashley and Gracie, her friend Kyle Donovan, Her grandfather Ben, family friend Stan Griffin (Doc), 3 dogs and 4 cats! The first thing that happens is the discovery of a body in the attic! Turns out it's Buck Barnes, a Gull Island resident This is such a great series and I was excited to read this book! In this installment of the series, TJ Jensen has traveled to Turtle Cove Resort on Gull Island to help her father's friend Garrett renovate his resort. The entourage includes TJ, her half-sisters Ashley and Gracie, her friend Kyle Donovan, Her grandfather Ben, family friend Stan Griffin (Doc), 3 dogs and 4 cats! The first thing that happens is the discovery of a body in the attic! Turns out it's Buck Barnes, a Gull Island resident who is a treasure hunter! The local deputy claims the death was from natural causes, but Doc a retired coroner knows better and strongly believes that the death was caused by a blow to the head. TJ investigates. Plenty of twists and turns and there is an interesting and talkative parrot named Blackbeard- who might be able to provide some clues. This is the seventh book in the Tj Jensen Paradise Lake Mysteries series and is an excellent read. The characters are likeable and realistic. The storyline and characters are well developed and the story flows along at a steady pace. I was captivated by this intriguing mystery from the first page until the end and had no idea who was behind everything. Even though this book is part of a series, Ms. Daley provides sufficient character background so that it can be read as a standalone. This cozy s This is the seventh book in the Tj Jensen Paradise Lake Mysteries series and is an excellent read. The characters are likeable and realistic. The storyline and characters are well developed and the story flows along at a steady pace. I was captivated by this intriguing mystery from the first page until the end and had no idea who was behind everything. Even though this book is part of a series, Ms. Daley provides sufficient character background so that it can be read as a standalone. This cozy series has become one of my favorites, and I'm looking forward to the next book. I would recommend this book to anyone who enjoys reading a well-crafted cozy mystery. Tj Jensen has agreed to oversee the renovations of Turtle Cove Resort on Gull Island for Garrett Hanford (her father’s friend) and provide a summer getaway for Ashley and Gracie (her two half-sisters), Kyle Donovan (her best friend), Ben (her grandfather), Stan Griffin (a family friend), and their three dogs, and four cats. Before they even unpack, they discover the body of Buck Barnes (a resident of Gull Island and treasure hunter) in the attic of the main house. Deputy Savage says Buck has been missing for 18 days and quickly rules the death to be from natural causes and closes the case, but Tj doesn’t agree and believes the deputy is covering up for someone and Ben, who is a retired coroner, believes the death was caused by a blow to the head. Tj and Kyle start asking questions and investigating clues Garrett’s talkative parrot, Blackbeard, provides. The group learns about local turtle nesting, pirate stories, treasure maps, and treasure hunting lore. First I wanted to go and stay at the picturesque place, and chuckled as the group unloaded to go into their lodging, people, dogs and cats, and they soon add a parrot. Tj’s friend needs help and since her Dad can’t come she is there to lend a hand with what to do with the resort. Of course we know that this is a murder mystery, and soon we find that there is a body in the attic, but why are the police calling natural causes. Kyle is there for Tj, and the girls, as they try and settle in I kept hop First I wanted to go and stay at the picturesque place, and chuckled as the group unloaded to go into their lodging, people, dogs and cats, and they soon add a parrot. Kyle is there for Tj, and the girls, as they try and settle in I kept hoping for a spark between them. We meet the locals, and they made me want to move there, so welcoming when they find out whom they are, and some remember a sullen Tj. We also have deal with big conglamorant who wants really to steal the beautiful land Tj is trying to save, and all the while you want to smack them. The answers are to come and you won’t be able to put this read down until you know the answers, a quick, sweet and enjoyable read. Now I need a parrot. The characters are well rounded and three dimensional. Tj is a loyal friend, persistent, and she cannot leave a mystery unsolved. Kyle is a wonderful friend and is very happy to help Tj and her sisters anyway he can. It was nice spending time with TJ, Kyle and her sisters and some of the other characters that I have met from this series. The author is very talented in her character development and as usual, she created characters that I would like to know in real life. I felt like I would like to visit Gull Island to spend time with the residents. The mystery is carried on well throughout the entire book. There were enough suspects to consider and clues to sift through that I was not sure who the killer was until it was revealed at the end. And there is a second mystery, whether or not there is really a treasure buried on the island, and if so, where it is at. As usual, the author intertwines a couple of mysteries to create even more suspense. I would recommend this book to anyone who enjoys a well crafted cozy mystery. If this a new to you series, you can read this without getting confused. And if you are are regular to the series, this book is a great edition. I received a free copy of this book from NetGalley in exchange for a honest review. I would like to thank NetGalley and Henery Press for the opportunity to read and review this book. TJ is back and her fans are in Paradise! Huzzah! She and her family are taking a vacation and she is looking forward to a little peace and quiet. (Insert evil movie villain laugh here.) Yeah. We know that's not going to happen! But no cozy reader expects that to happen - and, truth be told, no self-respecting cozy reader wants it to happen! So, the discovery of a dead treasure hunter in the main lodge leads to old legends, treasure maps, and even the quintessential pirate's bird - a talking parro TJ is back and her fans are in Paradise! Huzzah! She and her family are taking a vacation and she is looking forward to a little peace and quiet. (Insert evil movie villain laugh here.) Yeah. We know that's not going to happen! But no cozy reader expects that to happen - and, truth be told, no self-respecting cozy reader wants it to happen! So, the discovery of a dead treasure hunter in the main lodge leads to old legends, treasure maps, and even the quintessential pirate's bird - a talking parrot - who turns out to be quite the detective's assistant (and one of my favorite cozy mystery animals since I discovered the genre). Almost as talented as Kathi for authoring a number of series, each with a great heroine, and a number of adventures in each series. It's like she discovered a hush-hush "cozy perfect recipe" during the writing of one of her mysteries and will pass it along when the next student presents herself (or himself). What I'm trying to say (awkwardly, of course) is that Kathi Daley is one name that I can see on a book that will send it automatically to my TBR, even before I've read the title! you wish you were on vacation. the name of the day (in English) has a "y" in it. I loved this book, as I do with any Kathi Daley book. T.J. with her family and friends are on Turtle Island. T.J. is overseeing the renovation of her father's friend's resort since he is trying to recover from a stroke. T.J. is not expecting to be thrown into an investigation when she finds a dead body in the attic. Between investigating, helping her sister's to get settled and trying to settle her own life she is kept busy. What I love most about Ms. Daley's books is the sense of family and frie I loved this book, as I do with any Kathi Daley book. T.J. with her family and friends are on Turtle Island. T.J. is overseeing the renovation of her father's friend's resort since he is trying to recover from a stroke. T.J. is not expecting to be thrown into an investigation when she finds a dead body in the attic. Between investigating, helping her sister's to get settled and trying to settle her own life she is kept busy. What I love most about Ms. Daley's books is the sense of family and friends that always shines through, there is always that tight reliable bond. Her settings are described in such a way that it is easy to visualize, I could almost smell the sea air. The mystery was excellent, I found it interesting especially the way the parrot tied in. It added a nice twist. A good who done it. Tj's break from her life in Serenity on Paradise Lake, Nevada involves uprooting five people and seven pets for the summer. Finding a dead body in the attic on their arrival at Turtle Cove Resort on Gull Island, South Carolina sets Tj's inclination to investigate in motion. As Tj continues learning to parent her two young half-sisters, and coming to terms with her love life, the characters continue to bond with each other and with the series followers. More than just a cozy myste A good who done it. More than just a cozy mystery this book focuses on building relationships and personal growth. TJ and some of her pals are on the road with a working vacation on an island. While dealing with kids that are unhappy with summer plans, mixed feelings about her traveling companion and two "grandpas" in tow, they discover a dead body that has TJ and crew thinking that the local deputy might just be a killer! Great character development coupled with an intriguing plot that is complete with potential buried treasure, this book is definitely a good one for an afternoon of entertainment! TJ takes her sisters, her grandfather, her friend, Kyle and 7 animals to Gull Island, SC to take care of an old friend of the family's retreat. When she arrives, she and Kyle and Doc find a body in the attic. They call the police and start to learn about the victim, the deputy and all the players who might have killed the man. The reason she is so persistent is that Doc, a retired coroner, says that the man was murdered. While this goes on, she deals with someone trying to force a sale of the la TJ takes her sisters, her grandfather, her friend, Kyle and 7 animals to Gull Island, SC to take care of an old friend of the family's retreat. When she arrives, she and Kyle and Doc find a body in the attic. They call the police and start to learn about the victim, the deputy and all the players who might have killed the man. The reason she is so persistent is that Doc, a retired coroner, says that the man was murdered. While this goes on, she deals with someone trying to force a sale of the land she is currently taking care of. She also learns that she has feelings for Kyle and he has the same for her. I have come to really love the authors writing. She has such an expressive way to write that makes everything come to life. Her stories are always filled with fascinating facts and I appreciate her diligence to details. I loved reading about the plight of the turtles and loved learning about them. Tj has decided to spend her summer at Turtle Cove Resort helping her father's friend out. I love Tj so much and want to be her friend. She is someone you can trust and know she will always be there for I have come to really love the authors writing. She has such an expressive way to write that makes everything come to life. Her stories are always filled with fascinating facts and I appreciate her diligence to details. I loved reading about the plight of the turtles and loved learning about them. Tj has decided to spend her summer at Turtle Cove Resort helping her father's friend out. I love Tj so much and want to be her friend. She is someone you can trust and know she will always be there for you. Tj and her entourage pack up and head on an adventure that is exciting and action packed. The place they are staying at has an uninvited guest in the attic. Poor Tj finds a body that doesn't seem to be moving. It looks like Tj will have her hands full when the investigation starts . Why was there a body in the attic where Tj was going to be all summer? Someone thinks there is a map that will lead them to a treasure that will make them rich. I was ready to join them as the author made the story so intriguing. How fun would it be to explore caves, and deserted land hoping to find buried treasure? Tj is suspicious when the death of the person in the attic is ruled as natural causes. Who is hiding something about the death? I love how the author gives us a great mystery with subtle clues throughout the book. Her books are always fun to read and Tj is a character that I have enjoyed getting to know. I have to mention Blackbeard the parrot. Oh my I enjoyed this bird so much. I could picture him talking away as he tried to give clues to Tj. As always the author delivers another powerful story that has interesting characters and a well written mystery that had me not wanting the book to end. I can't wait to see what is in store for Tj next. Written by one of my favorite authors, Tj Jensen Mysters uses humor and well placed clues to keep readers glued to the story. Ms Dailey has let her characters evolve over the series. With her new publishing house she has proven her talent is as strong as ever. Once again we find Tj centered on her family and friends. They are headed to Turtle Cove Resort for the summer. Unfortunately coming across the body of dead treasure hunter in the attack puts a pall on their vacation. Eventually Tj takes up her own investigation when it appears the deputy appears more interested in covering up the crime than finding a muderer. Well written with fleshed out characters "Treasure In Paradise" is a a fast paced read that is filled with clues and red herring to keep the reader guessing until the very end. I must admit that although Tj Jensen stumbles onto a crime scene in the first chapter, it took me a little while to orient myself. I don’t think the fault of the confusion lies with the author but with my expectations. The series up to this point is set in a family owned resort in the mountains in Serenity, Nevada. In this book we find Tj spending the summer supervising the restoration of Turtle Cove Resort in South Carolina for a family friend who has had a stroke. She brings along four familiar faces, but we are also introduced to a whole new cast of characters. Treasure in Paradise has interesting characters whom Tj and the reader meet in her efforts to discover the killer of the man she found murdered at the resort and a long lost treasure map of pirate vintage. She also has conflicts with a resort developer and a sheriff who seems to be hiding something. There are some relationship developments as Tj struggles with two half-sisters uprooted for the summer, her friend Kyle, and her father’s impending marriage. I recommend this cozy mystery and am looking forward to the next one in the series, Fireworks in Paradise, to be released in October of 2017. I would like to extend my thanks to netgalley.com and to Henery Press for giving me the opportunity to read this book in exchange for an honest review. Tj Jensen and her family head to Turtle Cove Resort for summer vacation but there isn't going to be much relaxing as they find a dead body. Tj thought it would be fun to get away and a friend of hers was in the hospital and needed someone to look after his old resort. Someone was wanting to buy it but the old man isn't sure if he wants to sell and he thought Tj could watch over the resort and met with the man. They didn't expect to find a dead treasure hunter in the attic. It shouldn't bother her Tj Jensen and her family head to Turtle Cove Resort for summer vacation but there isn't going to be much relaxing as they find a dead body. It shouldn't bother her and she should just let the police handle things but she just can't quit thinking about the dead man and why he was in the attic. While the girls are enjoying outings at a summer camp she does a bit of snooping and Kyle helps out with her and volunteers with the camp. It seems the treasure hunter didn't have a very good reputation so it was easy to start finding suspects. TJ, the two young half-sisters she cares for, her grandfather, an older friend (?) who is a doctor, and longtime not-quite-romantic friend Kyle are spending the summer on a SC island to help renovate a resort for a friend of TJ's father who has had a stroke. The friend plans to sell the family resort, but only to someone who will run it the same way, though a big corporation is pressuring him and the locals to sell so a big resort can be built. TJ's prepared for most of that, but not for finding TJ, the two young half-sisters she cares for, her grandfather, an older friend (?) who is a doctor, and longtime not-quite-romantic friend Kyle are spending the summer on a SC island to help renovate a resort for a friend of TJ's father who has had a stroke. The friend plans to sell the family resort, but only to someone who will run it the same way, though a big corporation is pressuring him and the locals to sell so a big resort can be built. TJ's prepared for most of that, but not for finding a body in the attic the first day. The dead treasure hunter was supposedly looking for a pirate treasure map. As the family adjusts to life on the island, TJ investigates the crime, not being satisfied with the police investigation. There are the expected results, and she also comes to a decision about Kyle. Hail, hail, the gangs all here or so it seems when Tj brings family, friends and pets to help a family friend who has had a serious health issue. He owns a hotel that has fallen into disrepair. He is not going to be able to return and run the place so Tj and her crew decide to spend their summer doing renovations and getting the place ready for sale. There is already a prospective buyer but he wants to tear everything down and build a big resort. The townspeople are divided. Some see this as a boon to the local economy while others look at it as the first step toward the run of their way of life. Adding more uncertainty to the mix is the decision to call a murder an innocent death. Since it is Tj who found the body in the hotel, she feels compelled to investigate deeper. What baffles her is the local cop seems to know more than he is saying. Who is he protecting? What is all boils down to is an enjoyable summer read. I cannot say this is up with my favourite books lately but it was entertaining. In this installment, TJ Jensen and her family head to South Carolina to renovate an older resort. However, their plans are immediately thwarted when they find a dead body upon arriving. Who murdered the victim? When did he die? Is there really buried treasure in Gull Island? I really love Kathi Daley's books. Kathi's books are very well written and keep your interest until the end and then you want more. I finished book #7 of the Tj Jensen Mystery series and I wanted it to continue on and on so I am going to be reading book #8 Fireworks in Paradise next. If you haven't tried her books I do not think you will be disappointed. Thank you Kathi Daley for another amazing book. TJ Jensen and her family are on their way to Turtle Cove Resort for a much needed vacation. When you think of adventures, you think of buried treasure. Buried treasure….does that include someone looking for it? TJ doesn’t feel the local authorities are doing their job properly and sets out to see what really happened. The storyline moves like the sand on the beach on a windy day. A MUST READ! Tj, Kyle, her sisters, grandfather and Doc go to Turtle Cove Resort on Gull Island to help out a friend of her father's after he has a stroke. He has decided he needs to have the resort, that has fallen into disrepair, fixed up and sold to someone who would maintain the integrity of the property and keep it out of the hands of developers. Tj is to oversee the renovations. Before anything can get started, they find the body of a treasure hunter in the attic. What was he looking for in the attic? Tj, Kyle, her sisters, grandfather and Doc go to Turtle Cove Resort on Gull Island to help out a friend of her father's after he has a stroke. He has decided he needs to have the resort, that has fallen into disrepair, fixed up and sold to someone who would maintain the integrity of the property and keep it out of the hands of developers. Tj is to oversee the renovations. Before anything can get started, they find the body of a treasure hunter in the attic. What was he looking for in the attic? Is there a treasure? Was he murdered or did he die from a fall? These questions kept me moving forward, eager to find the answers! I loved the addition of a parrot in the story, especially one as smart as this one. I hope we don't have to wait too long for the next book in the series! Another fun read. This one takes place with TJ and her family (minus her dad) on vacation. It was nice to see the family in a different setting, but this book seemed a bit forced. My favorite character this time around was the parrot, Blackbeard. I enjoyed seeing TJ interact with other people, but it wasn't quite the same as when she's back home in Serenity. Still, it was a good read. Just when you think you know things are settled- they aren't. There is more going on than we think. I enjoyed the mystery and the idea of old maps and treasure hunts. Some treasure is not gold and gems. And maybe a new romance? I look forward to more TJ and friends. I always wish the books were longer so I could keep reading. Looking forward to the next one in the series! I have enjoyed all of the Paradise series so far and could not wait to read this one but I was somewhat disappointed in that I felt a little disconnect. There were a lot changes in TJ's life and those things were explained but just felt like I had missed something. Loved the story and the addition of the parrot. It was not my favorite book in the series but still good. I felt the book was slow in the middle, and then picked up toward the end. I'll keep reading series as I think there are so manu possibilities for where it can go. Kathi lives with her husband, kids, grandkids, and dogs in beautiful Lake Tahoe. When she isn't writing, Kathi likes to read (preferably at the beach or by the fire), cook (preferably something with chocolate or cheese,) and garden (planting and planning not weeding). She also enjoys spending time on the water when she's not hiking, biking, or snowshoeing, the miles of desolate trails surrounding Kathi lives with her husband, kids, grandkids, and dogs in beautiful Lake Tahoe. When she isn't writing, Kathi likes to read (preferably at the beach or by the fire), cook (preferably something with chocolate or cheese,) and garden (planting and planning not weeding). She also enjoys spending time on the water when she's not hiking, biking, or snowshoeing, the miles of desolate trails surrounding her home.